Blue passion flower or Passiflora caerula is a climbing vine of the passion flower family. 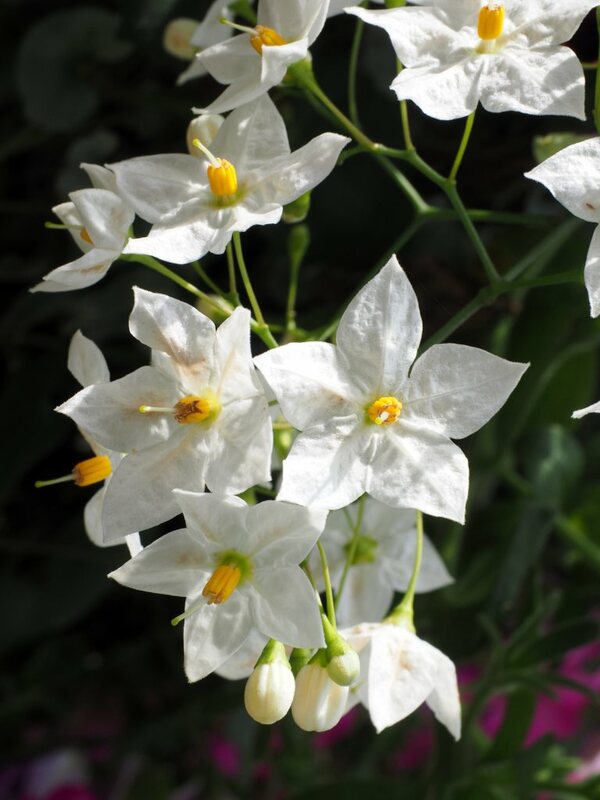 It was originally found in the tropical Americas and is frequently cultivated in hotter regions of the planet. In the days of Moctezuma, passion flowers were grown in the Aztec lords’ gardens. They were introduced in Europe in the 17th century and the plant immediately became part of local medicinal plant lore as a famed antispasmodic agent. In the flower itself, the faith-imbued people of the time imagined that the flower’s different parts symbolized various instruments used in the Passion of Christ (hammer and nails, crown of thorns…). This is what gave the flower its name. The passion flower that is cultivated in our temperate latitudes is the Passiflora caerulea or blue passion flower. You can plant your blue passion flower vine in the fall or in the spring, as long as freezing is over. It is a plant that doesn’t care much about the kind of soil it is planted in, but it will feel most comfortable in rich and well-drained soil. Avoid planting it in winter because this might kill it. Also avoid planting your blue passion flower during heat waves. Provide for frequent watering after having planted, especially if you have planted in the spring. The passion flower must develop its root system in the ground over the first year before the cold sets in. There are 2 techniques to multiply your blue passion flower: sowing from seeds and propagating cuttings. Passion flower seeds can be sown all year long; note that seeds must be soaked for 24 hours before sowing. 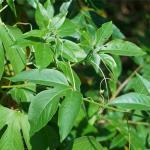 You can also multiply passion flower with cuttings over the summer, ideally from June to September. Making blue passion flower cuttings is relatively easy. Snip 6-inch (15 cm) cuttings off new growth stems that have not yet flowered. Remove lower pairs of leaves, keeping only the topmost pair. If you so wish, dip cuttings in powdered rooting agents. Plant cuttings in a seedling soil mix, preferably in a greenhouse. You will increase your success rate if you prepare your cuttings in a warm, moist environment. Prune the plant after it has bloomed in order to reduce its growth. 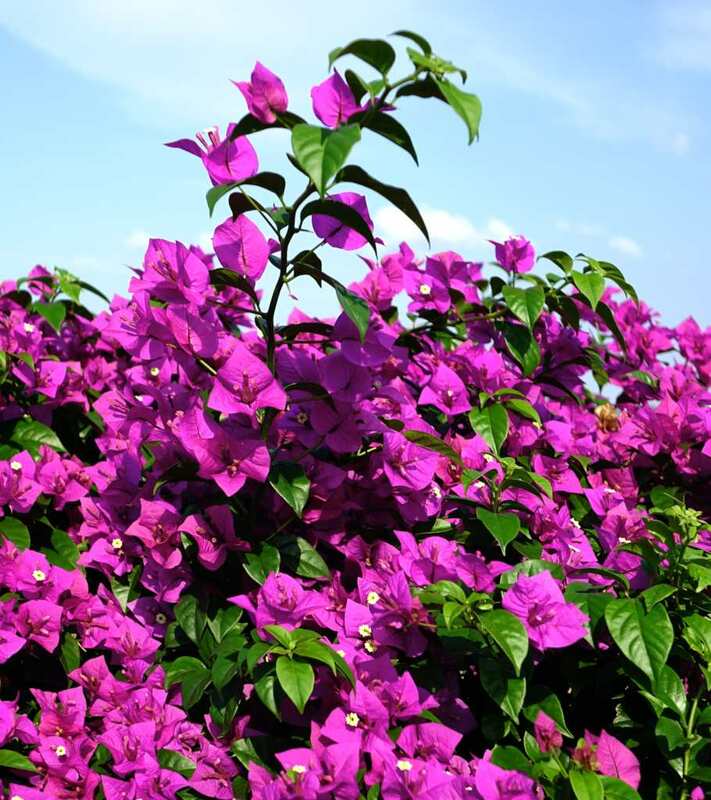 It develops quickly, and pruning will serve to increase the following year’s flower-bearing. You can cut back the year’s growth by at least half. In case of harsh winter climate, prefer planting in pots that can be brought in frost-free storage before temperatures fall below freezing. In case of mild winter climate, you may plant your Passiflora caerulea in the ground and mulch its base with a thick layer of mulch. In winter, protect the base of the plant with mulch because the cold could kill it. Do not let passion flowers spend time outside with temperatures that fall below freezing, except for Passiflora caerulea that is hardy enough to withstand temperatures as low as 14°F (-10°C). Water your passion flower generously after planting and then again during the summer in case of strong heat waves. Passion flower water needs depend on temperature and climate, so check if it would rain before watering. The Passiflora genus numbers over 500 species and they don’t all share the same cultivation needs nor do they cope evenly in similar climates. >Passiflora caerulea – This plant is hardy, since it resists temperatures as low as 14°F (-10°C), and is very decorative. This is the one that is most common in our latitudes. >Passion fruit or Passiflora edulis – Often grown indoors, in greenhouses or in lean-ins, it isn’t as hardy because it comes from the Central American tropical areas. Its fruits are edible and often used in cooking. >Purple Haze – The delicate fragrance and soft lavender-colored hue make this a passion flower that is very much appreciated by this family’s aficionados. 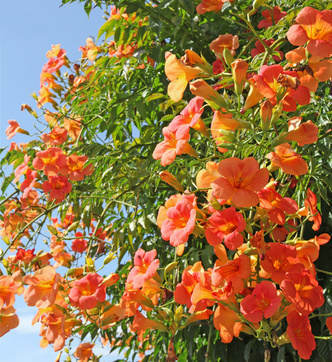 Magnificent climbing vines with flowers that recall the symbols of the Passion of Christ, its name is directly inspired from this coincidence. Passion flowers have long flower-bearing twining stems divided in three twisting lobes that let the plant hang on outcropping objects. 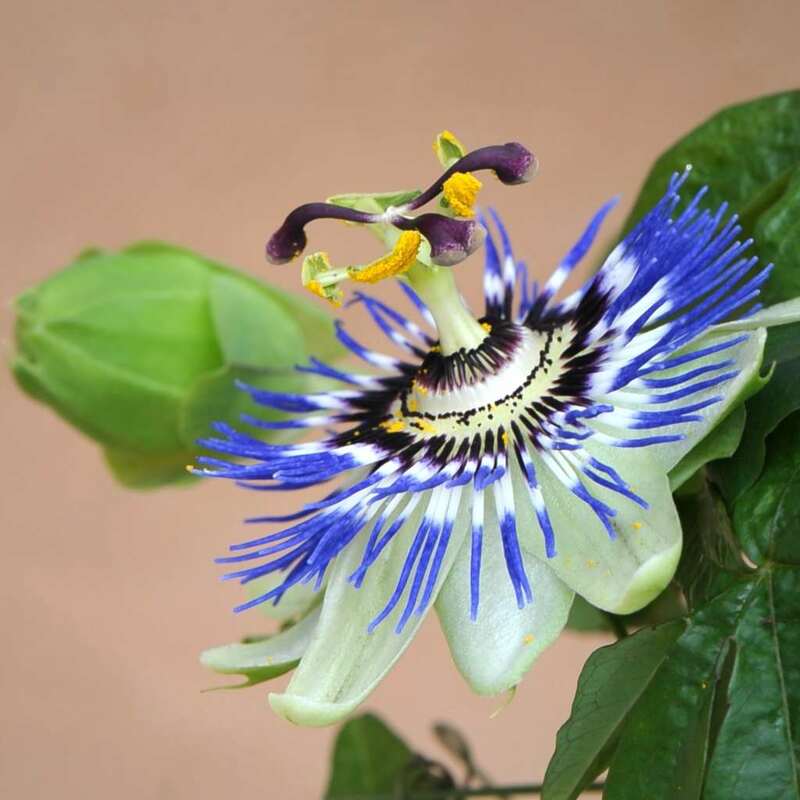 Passion flowers grow mostly in milder Asian and Central American climates, but several varieties also grow in our more temperate climates like the blue passion flower, Passiflora caerulea. You can let it grow alongside a wall with a lattice, and it will perfectly embellish a pergola or serve as an indoor plant. Passion flowers or their extracts are famed for soothing the nervous system, they are often used today for their sedative and hypnotic properties. Passion flower is recommended in cases of insomnia when brought upon by alcohol poisoning, menopause, nervous stimulation or neurasthenia. 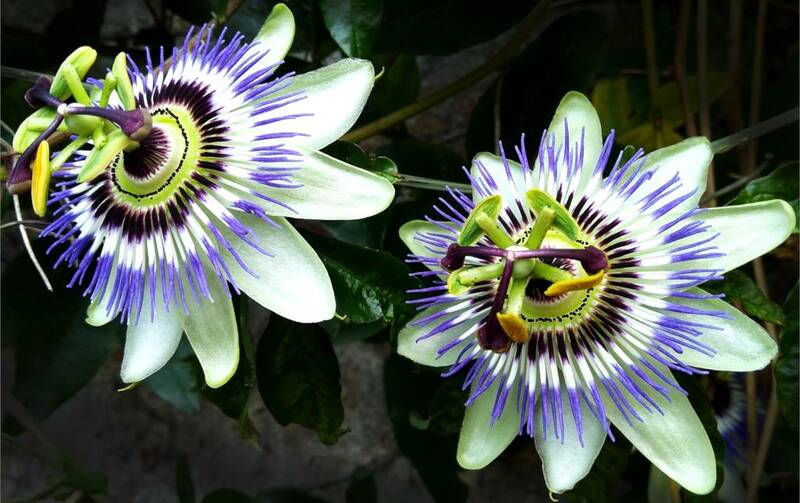 In persons overworked or vulnerable to anxiety, passion flower reduces anxiety. Good to know: the sleep it induces is natural. Using passion flower leads neither to addiction nor to nervous depression. Be not afraid! 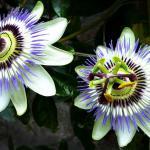 Menstrual pain and headaches are alleviated thanks to passion flower. Its antispasmodic properties are also recognized in case of asthma, hypertension, palpitations or muscle cramps. Testing in animals has shown that passion flower can counter the effect of having taken overly strong doses of marijuana (passion flower inhibits the psychotropic effect). Passion flower infusion, let 1 oz (25 g) of flowers steep 25 minutes in 1 quart (1 liter) boiling water. Drink 2 to 3 cups daily, with at least 1 cup an hour before going to bed. This reduces anxiety, enhances sleep, and helps withdraw from addictions like alcohol. Passion flower tincture, macerate 7 oz (200 g) of dried, crushed flowers in 1 quart (1 liter) of 60% (volume) alcohol. Close the bottle and keep for 10 days, shaking it from time to time. Filter. Drink 40 to 50 drops of this tincture before sleeping. In colder climates, cover the base well with a thick layer of mulch over the winter to protect it from the cold.